Makers of the quintessential, English waxed-cotton field wear for men, women, children and “Man’s best friend!” Sydnor Coffman, Barbour’s representative, will be on hand to help with your selections and fit. 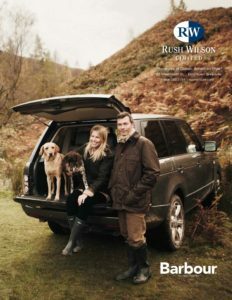 You will receive a free gift with your Barbour purchase. Bills Khakis Are Back! Since 1984, Bills has recreated the World War II era khakis into this symbol of original American style for the modern man. Made in the USA, Bills offers an expansive line of khakis, jeans, shirts, boxers, and belts. During the weekend, we will be showing the new collection for Spring. If you haven’t seen Bills for a while, come in and try on a pair of Vintage Twills or Supima Corduroys. We are offering a savings of 15% on Bills Khakis and a gift with purchase.